Ever heard the phrase, "it takes a village to raise a child?" Yes? Well, it's the same for a strategy. If you want to get buy in, to create change and build a strategy which your team owns, you have to involve everyone from the start. 1. Remind yourselves why you exist. Why what you do is important. Or, as Alan Clayton would put it, remind yourself of your dream. 2. Look back over the past few years. Note the milestones upon the way. Your achievements. Your innovations. See how far you have come. 3. Consider the context you are working in. Has anything changed? Are there new opportunities or pressures in the internal or external environment? Political? Economic? Social? Technological? 4. Brainstorm your strengths, weaknesses, opportunities and threats. 5. 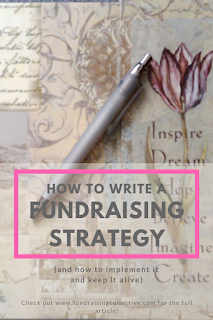 Consider which of your fundraising products / programmes is working well, which are failing. Is there any possibility of market growth? Is it better to invest, or to drop? Plot this against a Boston Matrix. Does your fundraising mix look balanced? 6. Map out who your stakeholders are and put yourselves in their shoes. Have each person take on a persona and consider what that stakeholder will expect of your team or department over the next few years. Note it all down. 7. Look at any emerging themes in your collective analysis and assess what the implications are. For example: Falling statutory income (from your PEST/SWOT) and increasing costs (from your SWOT), mean your CEO / Board will need to increase self generated income for operational costs. 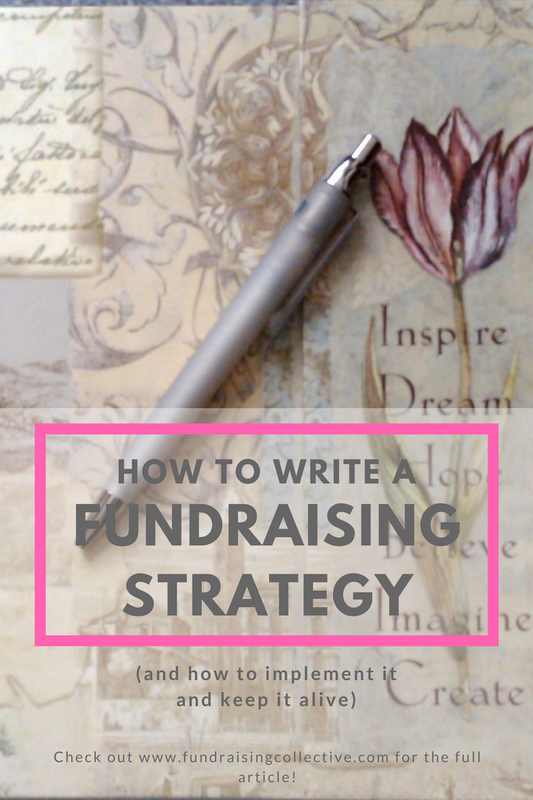 This is a driver for your fundraising strategy. It will shape the objectives you determine. Every objective you determine should answer a driver. Establish the baseline. What is the current position with regard to this objective e.g. we have 9000 regular givers and a retention rate of 70%. Decide how you will determine the objective has been completed e.g. number of regular givers and retention rate. Decide when the objective should have been completed e.g. by Year 5. Decide what you will monitor to know the objective is on track e.g. each year, percentage increase in regular givers and attrition / retention rates. Set targets e.g. in Year 1, 2% increase in retention and 1,000 new regular givers recruited. Agree the tasks which will deliver this in Year 1, who will own them and what resources will be required to deliver them e.g. new donor recruitment campaign, task owner Jenny Jones, resources required £9,000 for X, Y, Z. Consider critical dependencies and risks, identify how to ensure they are met or mitigated. At the end of this, you should a handful of drivers, a few objectives which answer those drivers, an owner for each objective, a note of completion looks like, what you will monitor, a target for each year and a note of the tasks / resources required to deliver these targets in year one and note of who will deliver them. 2. Sense check - can you really do all that? Consider your objectives in terms of doability and impact to decide what you should prioritise, and what might slide. What might your strategy paper look like? Who is reading it? 1 page executive summary which summarises the key thrusts of the strategy and asks the trustees to make a decision. This might simply be a decision to approve the strategy, or it might be a request for investment to support the strategy - new staff or funding for a donor recruitment campaign for example. An introduction which provides an overview, shows how your strategy aligns with the organisation's vision/strategic plan and communicates the key drivers which are addressed in the strategy. Brief analysis and summary of its implications e.g. PEST, SWOT, BOSTON MATRIX, with a review of your fundraising channels and where they are plotted against the Boston Matrix. Consideration of staffing and resources. Summary of your aims and objectives, and an indication of how they will be phased over the years of the strategy. What will happen in year 1 and year 2 etc. In putting this together, you might take it out more widely beyond your team and department. Consult with other heads of department or directors and get their feedback. Ensure it is in alignment with their plans. Give yourself time to incorporate their feedback. 1. Review the tasks and targets with your team. Again, consider again, "doability and impact" to help prioritise what to do first. 2. Weave your objectives into your annual departmental plan. 3. Ensure that your annual departmental plan is reflected in each individual person's workplan and annual targets and objectives. Review your annual plan at team meetings, and the individual work plans at one to ones. 4. Review your strategy with your team quarterly. Plot your progress against the targets you set and consider whether you need to invest more / take remedial action, move things forward, move things back, redistribute workload etc. Use every opportunity to engage the wider organisation in your strategy. Present at all staff presentations. Offer to do workshops for away days or heads of department. Post your strategy on your intranet. Have people come shadow your team, participate in donor meetings, take part in skill swaps. Be prepared for the unexpected. Mad stuff happens, for good or for ill. From ice bucket challenges to ICO fines - things will happen which knock your beautiful plans all out of kilter. Return to your original thought - "why are we here?" Consider your new context and revise your strategy and plans accordingly. A strategy, when all is told, is a road map to a destination. It doesn't really matter if you take a side road, or go three times round a roundabout, as long as you get there in the end.